Olive oil is very beneficial natural products discovered around 5,000 years ago used by Mediterranean cultures for its health and beauty benefits. Massage is considered a complementary medicine but is increasingly being offered alongside other modalities as an effective treatment for a range of ailments from stress, anxiety, digestive disorders, insomnia, sports injuries and headaches. 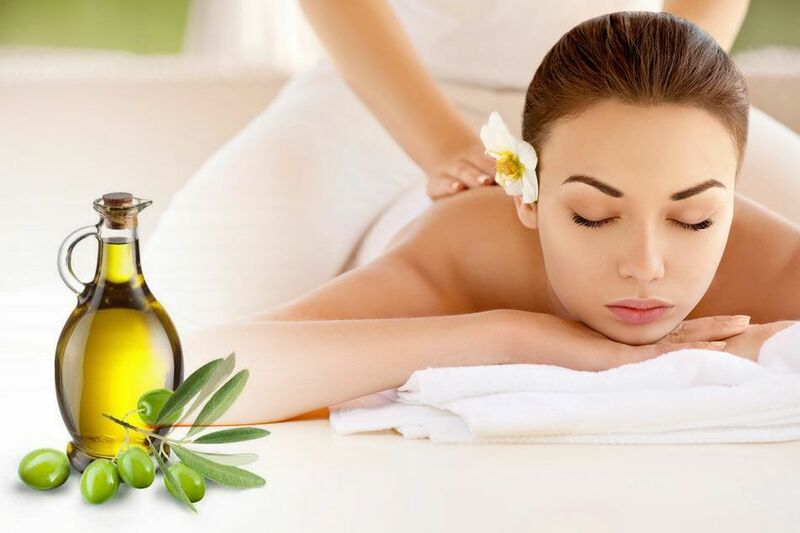 Olive oil massage has several health benefits and is widely used common base home-made massage treatment. It is rich in monounsaturated fats, omega-3 and omega-6 fatty acids, folic acid, vitamin E and K as well as antioxidants that are great for your overall body massage. Olive is loaded with lots of minerals, vitamins, and proteins and is used to have healthy hair, to keep nails and skin healthy and beautiful. It helps in regeneration of skin tissue and makes your skin smooth and soft. Massaging your skin daily with olive oil is an excellent way to combat dry or flaky skin caused by harsh weather. It may help to repair skin damaged from overexposure to the sun. The modern lifestyle is mostly sedentary, and the majority of our work is computer-centric that requires us to sit for long hours in front of the screen. This often puts a strain on muscles of the neck and shoulder. Some easy shoulder and neck stretching exercises or a re-energizing warm olive oil massage help in releasing the tension from the neck and shoulders by increasing blood circulation and energy flow. As it is rich in Vitamin E and antioxidants, an olive oil hair treatment and massage will help keep dandruff away. Simply apply olive oil to your head and hair and massage. Olive oil helps to heal dry, flaky scalp conditions such as dandruff, and scalp massage with olive oil promotes healthier, shinier and more manageable hair. If you work for a long time or feel tired of over workout then olive oil massage can give you instant relief by providing a nourishing and soothing body massage. It also helps in curing the pain of arthritis and gout. This massage is a good if one can accompany it with Yoga Poses. Benefits of olive oil for the skin are well known, and it is an amazing natural remedy to soothe and remove sunburn. Mix equal amount of olive oil and water in a bottle and shake well. Now apply this mixture and massage all over the body. The plant-derived anti-oxidants especially squalene, vitamins, and phytosterols present in olive oil help in soothing the skin irritation caused by sunburn and helps in lightening tan and making the skin tone even. Massage therapy on its own helps to relieve pain, aches and muscle spasms. But you may gain additional benefits when you use olive oil in massage treatments. This is by far, one of the most common uses of olive oil for the face. Olive oil is rich in plant-based antioxidants that helps in reducing wrinkles, crow’s feet and lines that appear on the forehead, outer corner of eyes and side of lips. It moisturizes and nourishes the skin in an intense manner and is loaded with nutrients, fatty acids, vitamins E and A, it helps in maintaining skin health and elasticity thereby preventing premature sagging and skin aging. Flaunt youthful and gorgeous looking skin by including olive oil massage in your daily skincare routine.